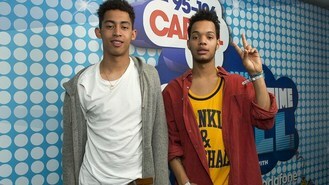 Chart stars Rizzle Kicks have announced that the Mobo Awards are to return to Liverpool this year. The Mama Do The Hump duo joined awards founder Kanya King to launch the annual bash two years after it was last staged on Merseyside. Rizzle Kicks - Jordan Stephens and Harley Alexander-Sule - were in the running for three gongs at the event last year and have high hopes for the next show which takes place at the Echo Arena on November 3. The event usually attracts major names from around the world with past performers including Jay-Z, Rihanna and Justin Timberlake. Jordan said: "Mobo is a great platform for music artists. We've always been big supporters of the awards and it's exciting we'll be announcing they are coming back to Liverpool." Kanya said: "This year's show will have some fabulous performances as always, with some great performances on the night." The city is now bracing itself for an economic boost from the awards. Bob Prattey, chief executive of ACC Liverpool which runs the arena, said: "As November's awards will take place on a Saturday night, the potential for economic impact is huge, with thousands of visitors expected to stay in the city for the weekend." Nominations for the awards will be announced next month and tickets go on sale from 9am tomorrow with more details at www.mobo.com. Alice Cooper was a surprise guest on stage for West End hit Rock Of Ages The Musical. A judge has granted Sheryl Crow a three-year restraining order against a man who admitted threatening to shoot the singer-songwriter and film executive Harvey Weinstein. Professor Green has helped launch a safety campaign, warning people of the dangers of wearing headphones while using level crossings. Will.i.am has been venting his anger on Twitter after his flash car was apparently stolen. George Michael has hit back at criticism that he cashed in on the Olympics by using the closing ceremony as the launchpad for his new single. Justin Bieber could be recording a version of the viral music hit Gangnam Style. Elbow look to be among the biggest winners of artists performing at the Olympic Closing Ceremony with a massive boost in sales. Nelly Furtado has confessed she feels like a veteran of the music scene. Cheryl Cole surprised her mother by performing at the Diamond Jubilee Concert - because she had kept her booking a secret.